Buckle your seatbelts and black out your windshields because we are about to blast RIGHT THROUGH that Welcome to Sunnydale sign, light up a Morley, and talk to James Marsters about his time playing the most beloved black-nailed, peroxide-headed vampire of all time: Spike! This is the Interview with a Vampire we have all truly been waiting for, is it not?! Be warned, this interview contains spoilers! Brand new Kristine Thune-designed shirt in the shop! Plus Local Girl Gang crewneck sweatshirts and kelly green Demon Lizard Patriarchy tees, wow wow wow wow wow! Visit bufferingthevampireslayer.com and click SHOP! 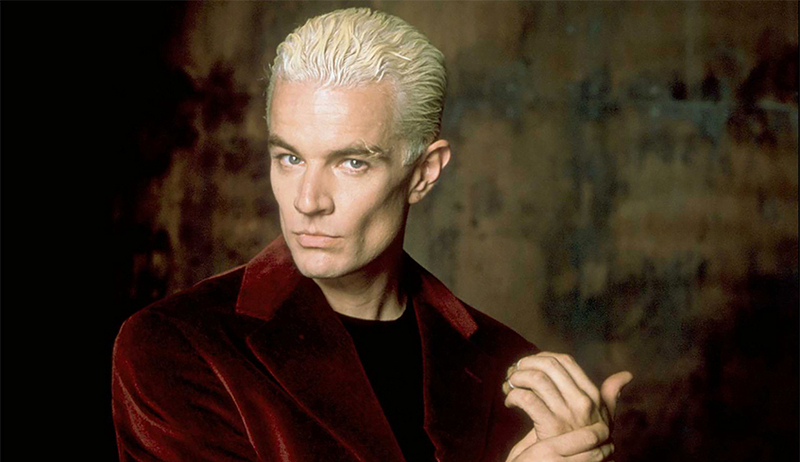 Fiona chats to actor James Marsters, known for his iconic role of Spike in 'Buffy the Vampire Slayer'. They talk about everything and anything to do with Buffy including how his role went from what was supposed to be just a few episodes to being with the series until the very end, as well as his favourite episode, and his absolute worst day on set. So, you may have noticed I've been quite busy for the last month or so (OMG I tweeted sooo much! ), & as a result, there were quite a few of James' French interviews that I didn't have the time to post here. I RTed them over on my Twitter, so if you follow me there, you probably caught them, but, like I said, I tweeted a lot, so you may have missed some, even if you do follow me! So, see below for all of James' interviews from his visit to France that haven't been posted here individually. I've also included any videos that were posted to YouTube further down. James Marsters: "Buffy the Vampire Slayer has always been more popular outside the United States"
Jamie's note: English translation of the interview. Scroll down (or hit the SOURCE link) for the original French version. James Marsters: "Buffy against vampires has always been more popular outside the United States"
Spike indulges in his vampire years. Meet. Invited this weekend of the Paris Manga Sci-Fi Show with his former colleagues of Buffy against vampires (Anthony Head and Amber Benson), James Marsters returns for Première on the range this cult series, the role of Spike and the Dragonball Evolution disaster , in which he played Piccolo. Whatever you do, we always bring you back to Buffy against the vampires and the character of Spike. But it's also because you cultivate this link, right? You had the feeling of selling yourself? Every couple years someone new seems to realise that the Ghost of the Robot song "Dangerous" was written about Michelle Trachtenberg. Now normally I'm happy to ignore whatever ignorant remarks are sparked & wait for the stupidity to blow over, but this time the article seems to have gained some traction (yay clickbaity headlines! ), so I've decided to say a thing. Yes, the song is about Michelle Trachtenberg (not for). No, the song is not about James Marsters crushing on/hitting on/being in any way inappropriate with a 15-year-old girl. Firstly, Michelle was 17-18 when the song was written. Secondly, & infinitely more importantly, the song is about her crushing on him. It is in no way an 'ode' or a 'love song' to an underage girl. It is about an underage girl having a crush on an older guy & him being flattered & embarrassed by it. While I'll be the first to admit that I find several of the lyrics problematic at best, I also understand that the highly dramatised lyrics are angsty & dramatic for exactly that effect (read all the lyrics below, not just the ones I've cherry-picked to support my argument). What I find more problematic is reading an article that compares James Marsters writing a song, to serial predator R Kelly abusing very young girls; that is as abhorrent as it is absurd! If you want to get up in arms about older men abusing young girls, please shout it from the freakin' rooftops, those predators deserve it! But to attack someone for writing a song & then comparing it to the actions of actual paedophiles?! Just... how even?! And to those who are bringing up his relationship with his, admittedly, much younger wife? They've been happily married for 8 years, together for 14 (read the adorable story of how they got together here). To be crude about it: If he was a predator, comparable to R Kelly & the like, wouldn't she be too old for him now? Hell, wouldn't she have been too old for him when he married her?! Movements like #MeToo & #TimesUp (of which James & his wife are huge supporters) send an incredibly powerful message to those in power who would abuse it, but that message is diminished when it's used to decry the completely incomparable & relatively innocent actions of the above. I understand that you want your website to get those all too important clicks, but tearing down a man who's done nothing wrong to do so? Is that really what you want your website to be, or to stand for? "You're a pretty little girl, got a thing for me"
Got a thing for me. Pretty straightforward. Not, got a thing for you, as many people have apparently chosen to interpret (which, how even?!). When you talk to me"
Those who read these lyrics from the angle of 'a predator wrote this' will likely interpret them to mean he has to look down at the young girl child, but factually Michelle is 1.71 m tall & James is 1.75 m tall, he'd never have to look down to speak with her. He's obviously talking about lowering his head in embarrassment over the fact a young girl has a crush & is flirting with him. And you don't even know it"
Again, if you incorrectly interpret these lyrics as having been written by a predator, they're gross in a very victim-blamey way. However if you read them as being written by a man embarrassed about a young girls crush on him (see above), then you'll realise that the 'danger' in the situation is exactly the problem with the aforementioned article: that people will think he's in to or has abused an underage girl. The danger is in his perfectly innocent reactions being misinterpreted as encouragement instead of a gentle let down. You'll be a too-hot baby, too good for me"
Again, gentle let down. In no way what-so-ever encouraging of a young girl crushing on a much older man, or inviting more than that, as a predator would do. "So set me down and leave me be"
I'd hasten to add that Michelle is an incredibly articulate & outspoken young woman, who has had naught to say about the song, & only good things about James. Were there even so much as a hint of impropriety on James' part, I highly doubt that would be the case. Janet Stein (Ever Carradine) and Victor Stein (James Marsters) are eager to get their son home on "Runaways." LOS ANGELES – James Marsters likens his work as an actor to that of a cake decorator. Jamie's note: The embed should start at James' interview, but if it doesn't, his interview starts at 7:17, if you want to skip ahead. Also, if the first embed doesn't work, scroll down for one that does. On Today's show Taz and Mike Stubbs are live from Ottawa with the London Knights while Jim is back in studio with Chelsea from Promotions and James Marsters (Spike) from Buffy the Vampire Slayer! While he may be known for playing one of the most popular bloodsuckers in TV history, James Marsters hasn’t forgotten what it’s like to be on the other side of the autograph line. In fact, as a 14-year-old Star Trek fan, the budding actor could be found wandering convention floors long before Spike made his mark on the tempestuous town of Sunnydale. While fans may have had mixed reactions to the news that a Buffy the Vampire Slayer reboot was in the works, not everyone shares that hesitation. James Marsters, who played the wonderfully chaotic vampire Spike in the original series, actually sounds pretty psyched about it! "I like the idea of making a new slayer in that universe that's not Buffy, whole new deal," Marsters recently told a small group of reporters at an event for his Hulu series Marvel's Runaways. "I think Joss [Whedon] being involved means it's going to be good... But I'm very happy that that theme of "don't give up" [which] basically is, I think, the theme of the show at the end of the day, I'm glad for that theme to keep getting played."